For some diseases such as cancer and cardiovascular disease, the link to beer consumption is already quite clear. Beer can also affect the immune system, bone, joint and kidney health, gallstones, well being and the quality of life. However, more research is needed before strong conclusions can be made on these effects. Besides the positive effects of moderate beer consumption on cardiovascular disease, type 2 diabetes and dementia, there might be other health effects, but research is scarce. Moderate alcohol consumption and bone health appear to be positively related, but the potential beneficial effects of some individual components of beer (such as silicon) need more investigation. Some research shows moderate alcohol consumption may protect against rheumatoid arthritis, but results are mixed and a mechanism for this protective effect has not been determined. The risk of gout may increase with alcohol consumption, but the mechanism behind this is not clear, nor is the effect of different types of alcoholic beverages. Moderate alcohol consumption does not affect kidney functioning. For protective effects against kidney stones and gallstones, and beneficial effects on the immune system, research is very limited and the optimal amount of beer consumption has not yet been determined. Well being and the quality of life seem to improve with moderate beer consumption due to the alcohol, but this relationship also needs more research. Alcohol in small and moderate quantities may have a beneficial effect on the immune system. Some studies reported that moderate alcohol consumption of 10–40 g per day could decrease the risk of the common cold. 167Others saw a decrease in inflammation and a better response to vaccines. 258Besides alcohol, other components in beer such as polyphenols may influence the immune system. 23There is very limited research available and more is needed to determine what effects are caused by alcohol and what are caused by the non-alcoholic components in beer. Light to moderate alcohol consumption (and specifically of beer), might reduce osteoporosis risk by increasing bone mineral density (BMD). The limited available research suggests that specifically beer consumption may be good for bone health. A population study showed an increase in BMD for men and postmenopausal women when they consumed two glasses (around 700 ml) of beer per day, referring to the effect of alcohol but also to another constituent in beer, silicon. 260The involvement of silicon was seen in another population study where the effect of moderate beer drinking on BMD was compared to non-beer alcoholic beverages. When results were corrected for dietary silicon intake, the magnitude of the effect on BMD decreased for beer, but remained the same with non-beer alcoholic beverages. 28Information on the amount of silicon in beer can be found in Chapter 2. Alcohol may play a role in decreasing the risk of rheumatoid arthritis, but may increase the risk of gout, another condition of the joints. Rheumatoid arthritis is an inflammatory disease of the joints. The prevalence in Europe varies from 0.3% in France to 0.8% in the United Kingdom. However, only few countries have available data on the prevalence of rheumatoid arthritis and this makes it unclear how many people suffer from this condition in the EU. 263Risk factors for getting rheumatoid arthritis are smoking, obesity and being overweight, little physical exercise, and it tends to run in families showing a genetic link. A meta-analysis found a 22% decrease in relative risk of rheumatoid arthritis for both women and men when looking at the results of multiple case-control studies (a type of population study). 264They did not find an effect of alcohol on risk of rheumatoid arthritis in another type of population study (cohort), 264but other researchers did. Women who drank 2–4 glasses of beer (350 ml per glass) per week had a 31% lower relative risk of rheumatoid arthritis than abstaining women. 265No research has been done in men. A mechanism for this effect is not yet established. Also there is no data available on the effect of alcohol in subjects already diagnosed with rheumatoid arthritis. Alcohol consumption can increase the risk of gout. A meta-analysis saw an increase of 16% in relative risk when drinking only one drink (defined as 12.5 g per day). Consumption of 1–3 drinks per day (12.6–37.4 g) caused an increase of 56%. 267In this meta-analysis, no specific beverages were analysed as there are not enough studies that have looked at individual types of beverages, and the mechanism behind the association of gout and alcohol is not clear. Moderate alcohol consumption may help to prevent kidney stones and it probably does not harm kidney function. As alcohol increases urine output, it could help to prevent kidney stones, hard masses of calcium formed in the kidneys. How many people in Europe have kidney stones is not clear, but it is a common disease that increases in prevalence with obesity, and drinking enough fluids is important in prevention. The risk of gallstones may decrease with alcohol consumption, but evidence is scarce. In one cohort study, the relative risk of gallstones decreased by 3% per 7.9 g of alcohol consumed per day for men, though in women no protective effect was found. 273But in another cohort study, women did benefit from alcohol consumption with a 14% reduction in relative risk with the consumption of 5.0–14.9 g per day. 274As explained in Chapter 5, HDL cholesterol and alcohol are associated. With moderate alcohol consumption, HDL concentrations in the blood can increase, and which may also increase bile acid formation, keeping cholesterol soluble and preventing gallstones from developing. 273However, to prove this mechanism and the link between alcohol and gallstones, more research will be needed. 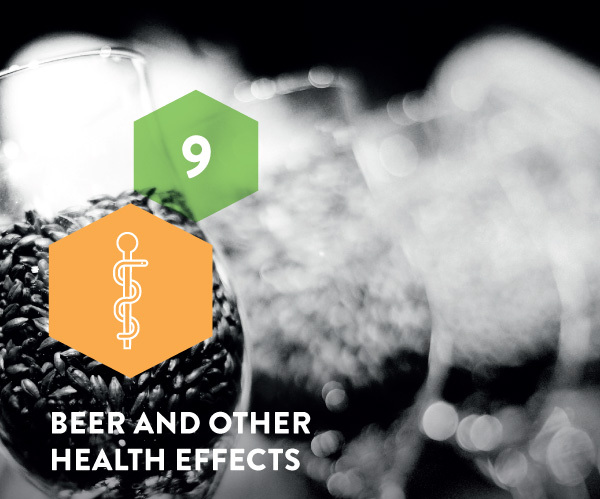 People enjoy the relaxing effect of drinking beer and other alcoholic beverages, but there is limited research on the effects of moderate alcohol consumption on well being and the quality of life.